Launceston is Tasmania's second biggest city and is located in the north of the state. 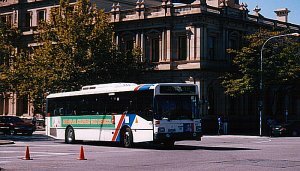 Metro operate route and school services in and around the suburbs of Launceston. 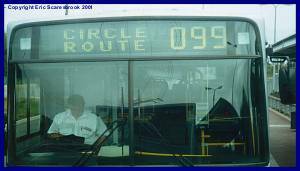 All photos are from my visit on 18 June 2001. You can see more photos here. Scania 154 south of the CBD on route 43. 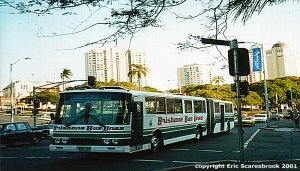 Scania 617 in the CBD on route 21. MAN 517 is painted in "The Busy Bee" colours on route 9 near the visitors centre. In the first photo, there is nothing shown in the destination indicator. Scania 619 on route 21 in the CBD. Scania 154 on route 54 in the CBD. Scania 617 on route 10 leaving the CBD. This pair of photos illustrates the difference between zooming in on the bus (top) and not zooming in (bottom). Last updated 09 December 2001.